With winter on its way, I have been bracing myself for the onslaught of infection that inevitably shows up at my house. I am due to have my fifth child this November, and it stresses me out when I think about trying to keep my newborn healthy during the winter months. I know from past experience, I will cringe and my heart will beat faster with every cough and sniff as I stare at my newborn and pray she won’t get what ever it is they are packing. My mama bear instincts will come out, and I will start viewing these otherwise sweet, innocent children as enemy number one. I decided it was time to do some research and see if there are some ways I can fight back. I realize, short of putting a DO NOT ENTER sign on the door and opting out of every holiday gathering, there really is no way to avoid all contact with the motley crew of viruses and bacteria that prey on us each winter. But there are some precautions we can take to reduce how many of them end up making themselves comfortable in our home. 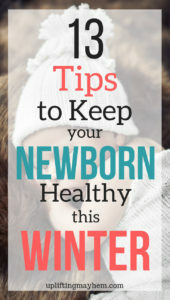 Here are 13 tips to keep your newborn healthy this winter from my own experience and research. Read on. 1- Teach your kids how to protect themselves from their classmates germs and how keep their germs to themselves. I know these things seem like common sense, but as a parent of children, surely you realize they don’t have much common sense until later in life, and unless you specifically outline these habits for them, they may never even occur to them. 2- Make your school children change their clothes the minute they walk in the door from school and then have them wash their hands. Easier said than done, I know, but this is the best way to get the school germs off of them and away from your newborn baby. 3- Avoid taking your children with you to public places unless it is absolutely necessary that you bring them along. I will often go shopping at 10:00 at night when the kids are in bed and my husband is home for two reasons. First reason is shopping with all my children is usually a miserable experience and second, I can drastically reduce the number of germs that follow us home from the store if my hands are the only ones that touched anything. I realize there are times when you just have to take them. Bring along your hand sanitizer and for your little one riding in the cart, invest in one of these. You can also use it at restaurants to cover high chairs which is an added bonus. 4- Put your baby’s health before your desire to make other people feel comfortable. This is the hardest one to do, but if a neighborhood kid comes over with a hacking cough, as kindly as you can, send them home. When you go to family or friend gatherings, don’t be afraid to ask people to wash their hands before holding your baby. Bring along your hand sanitizer and offer it to them before they hold the baby. Be selective about what gatherings you go to. If the setting might expose your newborn to an onslaught of germs, just don’t go. Another option is to wear your baby in a wrap like this one . 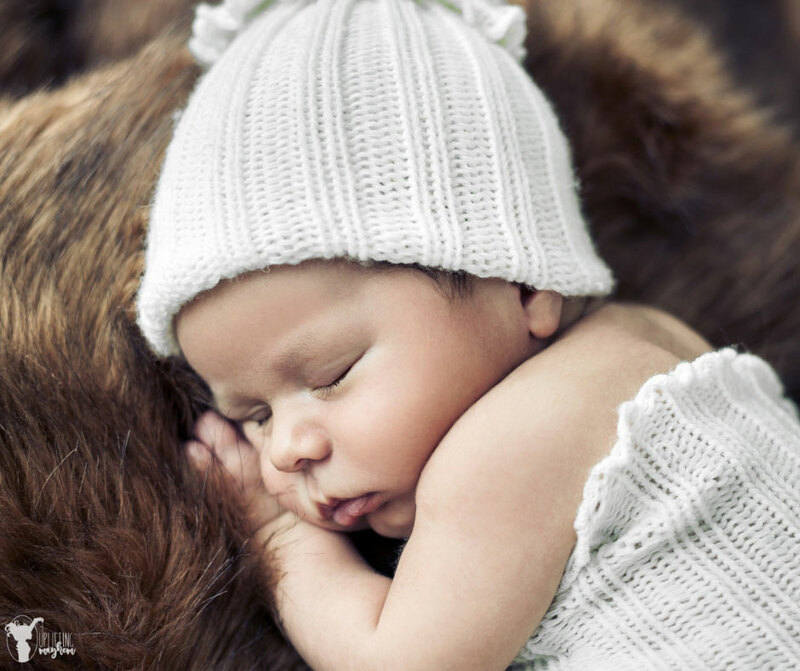 5- The best way to keep your newborn healthy is to keep yourself healthy. Eating a healthy diet high in vitamins (particularly Vitamin C) and low in sugar which breeds infection. You can read more about the importance of that here. Engaging in some form of moderate exercise if possible. Studies have shown this also boosts your immune response. You can read more about that here. 6- Get out into the sunlight, even if it is cold. Bundle up your kids and spend time outside on sunny winter days. Vitamin D has been shown to be a very important part of the body’s immune response and the best way to get it is directly from the sun. You can use Vitamin D supplements if you just can’t seem to find your way into the sunlight, but they are not as effective. Getting out of the house into the fresh air is good for everyone. When your family is cooped up in the house all day for weeks on end, the germs tend to pile up. Get some fresh air and sunlight as often as you can- your newborn included. 7- Carry a pen with you. This way you can avoid having to use the pen everyone else has been touching at the bank and the store to sign credit card receipts, thereby avoiding getting the germs of a hundred different strangers on your fingers that are about to rub your eyes or put food in your mouth. 8- Consider putting a kind sign on your front door. Make a sign that says something like- “Help us keep our newborn healthy by only visiting if you are healthy.” This allows people to think twice before knocking and will hopefully help you avoid having to awkwardly ask them to leave or not hold your baby once they are in your house sporting some kind of illness. 9- Replace everyone’s toothbrushes every couple of months or right after a sickness has gone through your family. Sometimes germs will linger on your toothbrush and you will end up getting sick again. Another thing you can do is put your toothbrushes in the dishwasher and get them sterilized and clean again. 10- Wash your sheets and pillowcases often. I don’t know about you but my boys’ pillowcases are always covered in sweat, snot or some other bodily fluids. If you can’t do the sheets often, then just do the pillowcases. 11 – Wipe down all your door knobs with Clorox wipes every day. This will keep the germs that linger and grow there to a minimum. The door knobs is a surface that is touched by everybody! I would always wipe down the light switches as well. 12 – Have On Guard or other essential oils diffusing during sick season. When my kids get sick, they enter my room and usually don’t exit until they feel better (unless it’s a lingering cold). I turn on our oil diffuser in our room and keep it going all the time. You can also keep the diffuser going throughout cold and flu season in the main area in your home. Teach your kids to kiss your baby’s head and not on the cheek. Have them keep their hands away from baby’s mouth and eyes (I know! Those eye keep moving and are squishy. It’s hard to keep those curious hands away) Teach them young and help them understand the why behind it all!! There is a good chance your baby will still pick up a few bugs despite your best efforts- that is just a part of growing up. They have to build their immune system somehow. But, hopefully these tips will help you avoid the big bugs until their little bodies grow stronger and are better able to handle them.